"I've thought about this a lot. Being extraordinary." I generally run screaming from any family drama centered around a mentally handicapped individual, because past experience has shown me that screenwriters and actors seldom can find a satisfying way to make these type of films anything more than emotionally manipulative treacle, rather than imbuing characters with any identifiable degree of real-life humanity. Leave it to a small indie film like Melissa Painter's Admissions to cut through the usual histrionics and yet still convey a warm and moving story about the familial love between Emily, a child-like 20-year-old savant (Taylor Roberts) and Evie, her college-bound 17-year-old sister (Lauren Ambrose). Painter, adapting Dawn O'Leary's play-turned-screenplay, introduces two parallel stories, one concerning Evie's intentional sabotaging of her college admissions interviews and the other about Emily's sudden ability to write beautiful poetry. Amy Madigan, again delivering one of her stern but warm motherly roles, plays the girls' mother, and she is so overcome by the hope reflected by the flurry of poetry that an appearance on a local television show on the subject of savants leads to a dramatic turning point that gets treated with a gentle honesty that most films like this would hammer with overblown dramatics. 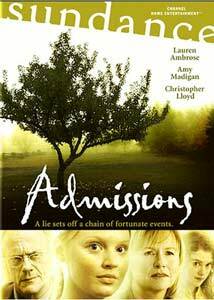 Ambrose, stepping away from her moody character of Claire from Six Feet Under, plays Evie with a fraction of the thick skin that we're used to seeing her in, and her pure love for her sister is natural and wonderfully unaffected, one of the surprising treats in Admissions. Taylor Roberts, left with the potentially troublesome role of playing a savant, tones down the usual "acting" quirks most actors feel the need to embellish such roles with, and thankfully never seems compelled to go over the top. The result is a performance that is perfectly understated, unlike, say, the laughably shrill spin by Rosie O'Donnell in Riding the Bus with My Sister. Future filmmakers and screenwriters should take a long hard look at Admissions to get a handle on the right way to handle a family drama. There's no need for actors scream, throw things or flail about, because a film like this shows that slow and steady can win the race, and that quiet performances can often echo louder and with far more impact. Image Transfer Review: The 1.85:1 anamorphic widescreen transfer sports quite a bit of grain throughout, but otherwise carries intentionally soft colors and even, well-rendered fleshtones for the duration. Audio Transfer Review: The Dolby Digital 5.1 surround track doesn't get much opportunity to really show itself off, as this is largely a talkie drama, but the front channels deliver a warm and open sound stage. Not much in the way of rear channel activity, but a pleasant and crisp presentation where it counts. Extras Review: No extras other than a few trailers, with the disc cut into 16 chapters. Don't let the "Lifetime movie" feel of this one scare you off, because the acting and flow of Admissions is wholly unassuming, gentle and very, very sweet. A definite rental for fans of family dramas.